The Grade 5 and 9 ActivPass starts today, September 24, 2018! Grade 5 students receive their ActivPass at their school. Grade 9 students can either use their school student ID card or they can ask their front office for an ActivPass card. The ActivPass grants FREE access to participating facilities at designated times. Activities include swimming, skating and gym use. Remind students to use their free Kingston Transit Pass to get to facilities. 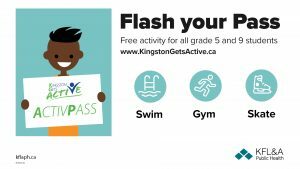 For more information and for a schedule, visit the Kingston Gets Active ActivPass page.